iPhones attract the attention of the world media like no other consumer gadget, and every detail about the devices, no matter how small, always manage to create some splash. 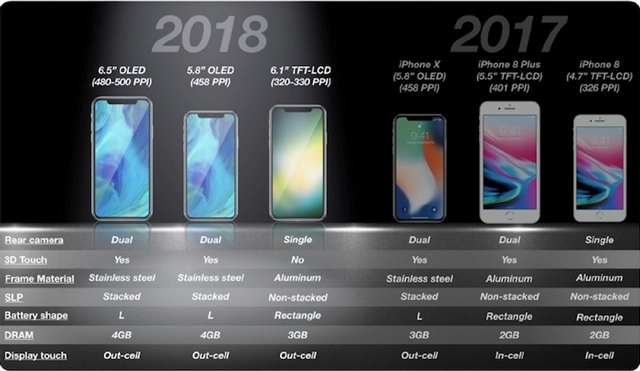 While we already knew quite a bit about Apple’s upcoming iPhone lineup for this year, thanks to persistent leaks from various sources, it is now the turn of KGI Securities analyst Ming-chi Kuo, well-known for his insights about Apple and its gadgets, to come forth with some new revelations about the 2018 Apple iPhones. Kuo has published three research notes about the upcoming gadgets, revealing some new details and seemingly corroborating some of the stuff we had read earlier. First off, let’s start with the rumored 6.1-inch device that’s expected to be the most affordable iPhone this year. According to Kuo, Taiwanese manufacturers Pegatron, Foxconn, and Wistron will be the key assemblers of that device, with 60 percent, 30 percent and 10 percent allocation respectively. It’s not immediately known which markets will get which models. Kuo also says that Japan Display Inc. (JDI) will supply around 70 percent of the LCD panels for the device. The Cupertino giant will apparently use JDI’s Full-Active LCD panels that will allow the phones to sport ultra-slim 0.5mm bezels on all four sides. In separate research notes, Kuo also revealed some important new details about the next-gen iPhone X and its larger, 6.5-inch sibling that’s expected to be named the iPhone X Plus. According to him, both will ship with at least 4GB of RAM while their cheaper sibling will come with only 3GB. The iPhone X Plus is also said to have a dual-cell 3,300-3,400 mAh battery, which will be roughly 25 percent larger than the 2nd-gen iPhone X that is rumored to ship with a one-cell battery rated at 2,850-2,950 mAh.